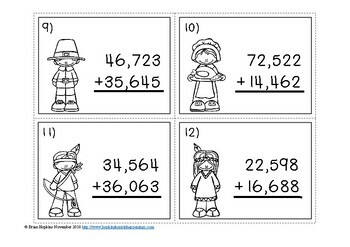 Thanksgiving Addition 5 Digit by 5 Digit Regrouping uses 24 task cards and is perfect for your math centers, stations, rotations, to play the game "Scoot" or "Quiz, Quiz Trade", for early finishers, small groups, RTI, journals, etc. There is a recording sheet and answer sheet. If laminated students can write on them with dry erase markers. These are in color and black and white. 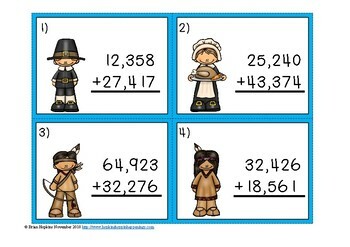 These work well for a Thanksgiving theme in November.